You are here: Home / Every Day Lives / Tips and Tryouts / Blow Outs and Fires! Last week the woman who has been cutting my hair for years finally convinced me to walk over to the dark side with a Brazilian Blow Out. What is it you ask? It’s a “softener” for hair and “improves its condition the more you do it” is how it was put to me. My hair, for those of you who haven’t witnessed it first hand, is curly. Mega curly, uber curly. No ways around it. I do like my hair on most days, extremely humid days don’t count. Tricia said that with the Blow Out, my hair would still be curly but it would be much easier to blow straight and it wouldn’t frizz up in the humidity if I wore it curly. It has been quite a while since I’ve blown it straight since that typically is a 35 minute process involving a blow dryer, flat iron, sweat, and extreme upper body strength. The idea of cutting this time down and actually being able to wear it straight more often was a nice idea so I took the plunge. Before the process started, I questioned Tricia like a person highly skilled in water boarding to make sure I had all the information needed. Yes, it would still be curly. Easier to blow out. No line as it grows out. No burning, no breakage. And so on. Phew. The process was pretty simple. She sat me at the shampoo bowl and put mystery liquid in my hair to clarify it and remove build up. I sat for maybe 3 minutes with it on and then she shampooed me. Then we went over to her chair and she clipped all of my hair up but the very bottom layer. She painted on the blow out solution with a brush onto each and every section, just like you would getting your hair colored. 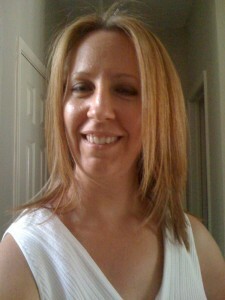 Once every last bit was covered, she blew my hair dry straight with a round brush and then flat ironed each section. Viola! That was it and I was done. The entire process took about an hour and 15 minutes or so. I was told I could treat my hair just like I would any other time. The blow out is supposed to last about 3 months and wear off slowly. They recommended that I use a shampoo without sulfates since harsh shampoo would strip it out faster. I already use a sulfate free shampoo, so no changes were even necessary. It was on the verge of storming when I left the salon so I can confirm that for the first time ever, my hair did not immediately frizz into a ball of puff upon the first whiff of humidity. It stayed smooth the entire night and through the HIIT workout sweat the following morning. There was a brief freak out the next morning. After my workout, there was no way I was not going to shower but I decided to just rinse my hair instead of shampooing. When I got out, there was NO curl. My hair hung there limp in defeat for the first time. I blew it dry straight with my fingers and didn’t even need to use a brush. I tried not to panic because I didn’t want to kill the curl, only to tame it a bit. Thankfully my panic was short lived as the curl is coming back now that I’ve shampooed it. It definitely is not as curly as before, but the curl is there and I can choose easily between straight and curly now. The pictures above from left to right are Before, After Curly, and After Straight so that you can compare. Blow drying straight now takes 5 minutes with just a brush, no flat iron needed at all. We will see if it lasts three months as promised. I’ll be posting more pics as the time passes. Supposedly it just gradually washes out over the 3 months and returns to my usual hair. I’m not sure yet if I will have another one done, but it seems promising at this point. The workouts are going well too. The 5 Day Inferno and the first week’s class schedule of TurboFire are done! Today is the big day of weights and measurements. Keep your fingers crossed for me. I know my weight has dropped. I’m not sure about the measurements though. I’ve stayed with my nutrition plan without fail, logging every last thing that I ate and every calorie burned. They are absolutely right when they say HIIT workouts raise your metabolism. I typically burn about 120 calories walking Thing Two on a typically evening. When I walk him after my HIIT workout, the heart rate monitor reads 225! Booyah! Thing Two now has to wait until HIIT is done before he gets his workout. Happy 4th! Come join in the TurboFire Challenge. It’s going strong now and there’s plenty of motivation to go around. Keep pushing play!